Can I just say thank you NASA? Thank you, thank you, thank you! 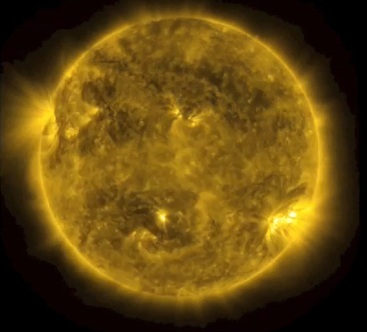 The good folks at NASA have brought us this jaw-dropping timelapse of our almost unimaginably beautiful Sun. It was taken by NASA’s Solar Dynamics Observatory (or, as the cool kids call it SDO) as it orbited our planet for the last three years. The SDO is whipping around the Earth at 6,876 mph and the Earth is flying around the sun at a mind boggling 67,062 mph. The almost four minute long video…two images per day…was captured in extreme ultraviolet light (171 angstroms) and transposed into light our puny little human eyeballs can handle. The temperature of what we are looking at is around 600,000 kelvins (about 1.08 million F). And all for the low low price of a ticket to ride this tiny blue marble floating in space. Prepare to be blow away. And feel your jaw drop as you watch this ode to Sol.